The CDC’s 2018 edition of it’s“Health Information for International Travel” guide is now available and accessible for free online. Often referred to simply as the “Yellow Book” for it’s yellow cover, the updated edition is also available in hard copy through online booksellers and Oxford University Press. To access the online version of the CDC’s 2018 edition of the “Yellow Book,” please click on the image. The guide’s new edition features revisions, new sections, updated health recommendations for travelers, and a more user-friendly layout, according to a news release from the Centers for Disease Control and Prevention. 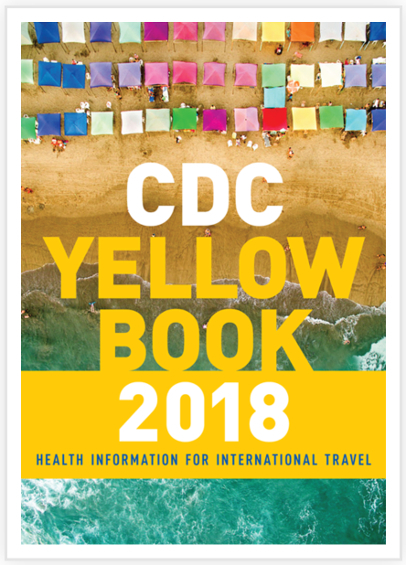 The “Yellow Book” also provides travelers with specific food safety information for international trip preparation and for maintaining good health while abroad. This includes planning for healthy travel by anticipating food risks, and monitoring important symptoms and complications during travel, and after returning home. In the 2018 edition, sections such as “Fever in Returned Travelers,” “Cruise Ship Travel” and “Traveling with Infants and Children” all include updated information about food safety awareness and actions travelers can take to reduce risk. “Foods served to children should be thoroughly cooked and eaten while still hot; fruits eaten raw should be peeled by the caregiver immediately before consumption,” according to the section on traveling with children. Guides for air crews, health care workers, humanitarian aid workers, missionaries, and others who provide care and support overseas. For more information, or to access the guide, visit the CDC’s Yellow Book page.